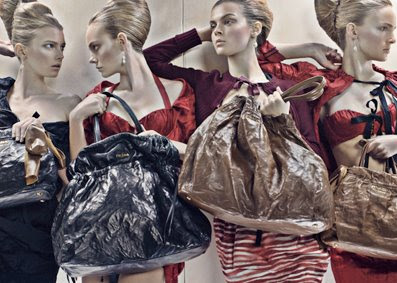 Available for viewing online now are the new campaign ads from the Spring-Summer 2009 Womens Prada ad campaign. While I am still not sure about the bags on offer (crinkled purse anyone? ), I do like the look and feel of the campaign even though it must have taken many hours just to ‘airbrush’ everything to near perfection.